Dinosaurs, rowdy college students, and a sequel that isn't. 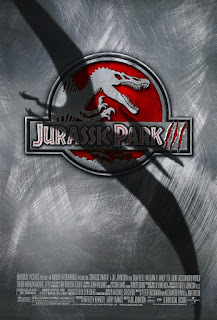 Jurassic Park III has a bad reputation, but I've always had a soft spot for this maligned sequel, and probably not just because it was the first Jurassic Park movie I managed to see in the theatre. Regardless of where I first saw it, I have always found it to be much more entertaining than the previous sequel. While III retains the impressive special effects of its predecessors, it is more of a B-movie creature feature. 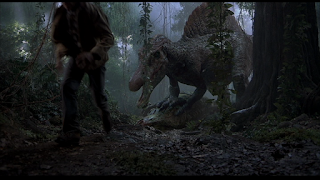 Jurassic Park and The Lost World: Jurassic Park were both blockbuster spectacles, but part 3 is just a monster movie that moves through its story in a brisk 92 minutes. That's a running time I can appreciate after the 127 / 129 minute run times of the previous movies. Scripted by Peter Buchman, Alexander Payne, and Jim Taylor, without a Michael Crichton to work from this time around, III is also a film populated by morons. The stupid decisions start right up front, when some people decide to go parasailing right off the coast of Isla Sorna, the restricted, dinosaur-inhabited island that served as the primary setting of The Lost World. Something goes terribly wrong, as you'd expect, and a boy - Trevor Morgan as Eric Kirby - winds up stranded on the island alone, the only survivor of this fun day out. So what do Eric's parents Paul (William H. Macy) and Amanda (Téa Leoni) do? They put together their own search and rescue mission. They have their mercenaries (John Diehl, Michael Jeter, and Bruce A. Young) who can blow away dinosaurs if necessary, but they need someone who has both knowledge of dinosaurs and experience on Isla Sorna - so they seek the help of paleontologist Dr. Alan Grant (Sam Neill)... who has never been to Isla Sorna. Grant was only in the first Jurassic Park, which was set on the nearby island Isla Nublar. Paul and Amanda got confused and thought Grant was involved with the things we saw in The Lost World. Considering the dinosaurs on Isla Sorna to be "theme park monsters", Grant's focus is still on learning about dinosaurs through the study of fossils. His refusal to cash in on his Jurassic Park experience (beyond the book he wrote about it) is causing him some financial trouble, so he only agrees to fly over Isla Sorna with the Kirbys in hopes of getting some cash. He was not informed that they would be landing on the island to search for someone. And landing on the island causes them to be stranded there, too. Now Grant, accompanied by the Kirbys, the mercenaries, paleontology student Billy Brennan (Alessandro Nivola), and eventually Eric, has to survive being trapped on an island full of dinosaurs all over again. As far as the dinosaurs go, a notable new addition is the Spinosaurus, a creature similar to the Tyrannosaurus but even bigger. This dinosaur is a point of contention for some Jurassic Park fans because the film establishes that the creature is a major threat by having it beat a Tyrannosaurus in a fight. 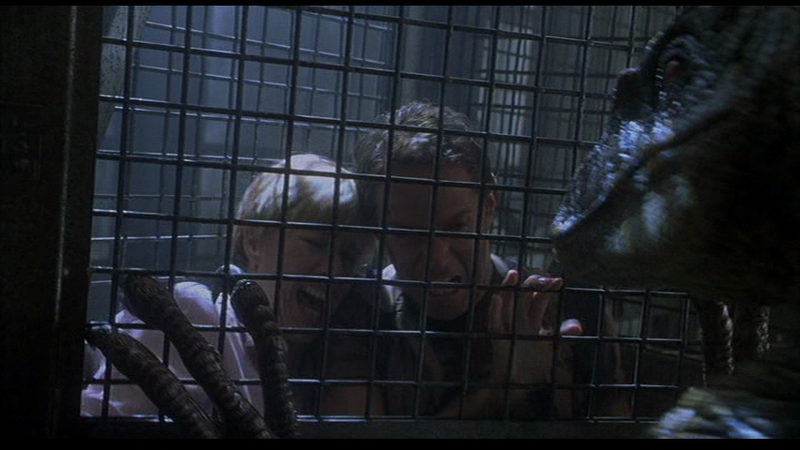 This means nothing to me, but some fans were quite upset by a Tyrannosaurus getting beaten in a Jurassic Park movie. The other most prominent dinosaurs are, of course, the Velociraptors. Having noticed a resonating chamber inside Velociraptor skulls, Grant has come to realize that those creatures were highly intelligent and has figured out that they communicated with each other through the sounds made through the resonating chamber. 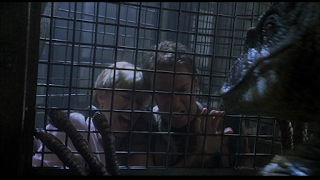 Billy has recently printed up a replica of a resonating chamber for Grant, who ends up using it at a point when they are in serious danger of becoming Velociraptor meals. 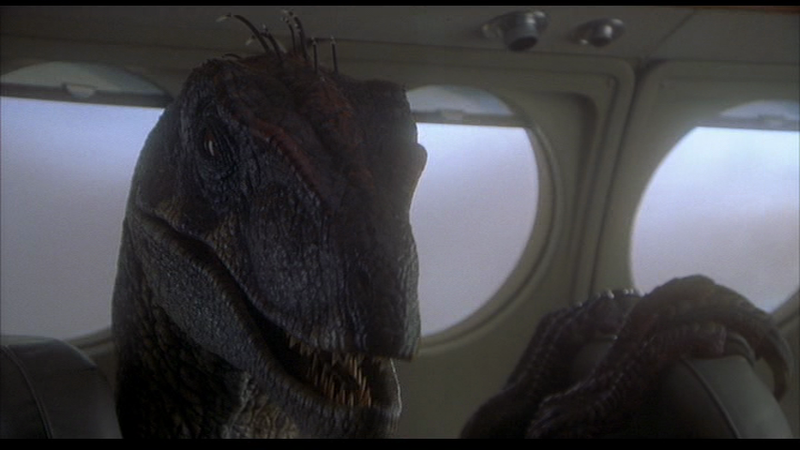 The Velociraptors don't only communicate through those sounds, either. 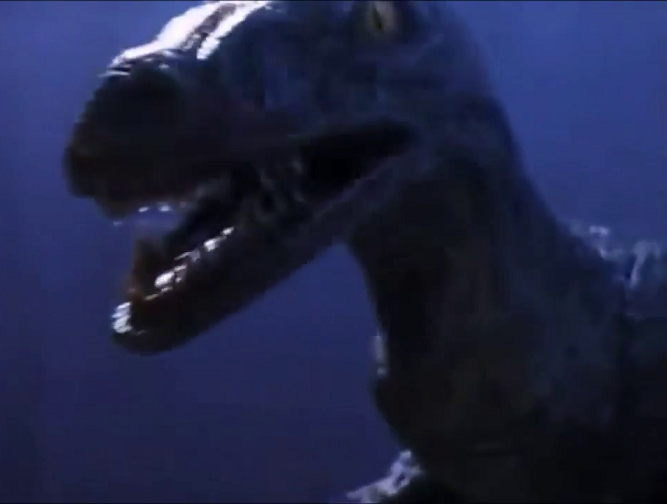 There is a very goofy moment in which a Velociraptor speaks English to Grant, saying his name. "Alan." Thankfully this is just a dream. Grant is the only returning character to encounter dinosaurs again, but he's not the only character who's back from Jurassic Park. His former co-worker and one-time potential love interest Ellie Sattler (Laura Dern) is also back, now Ellie Degler - married to another man and raising a couple kids. When she finds out that Grant is in trouble, she does her best to help him without leaving her house. It's somewhat disappointing that Ellie and Alan didn't end up together, but it was good to see them both again regardless. 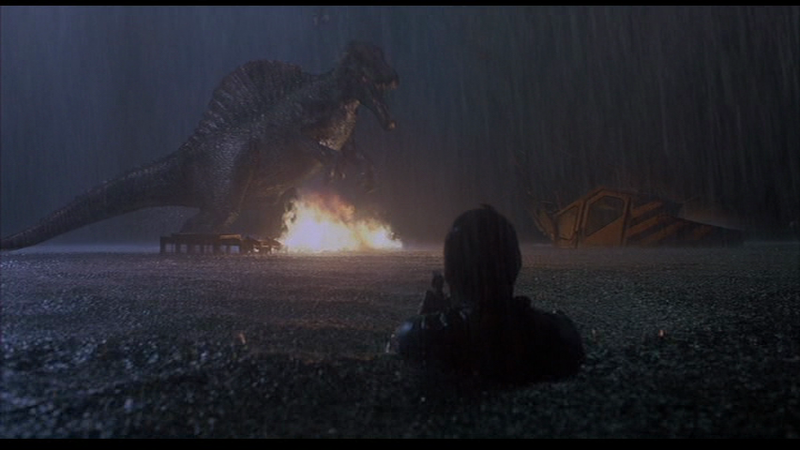 Directed by Joe Johnston (Captain America: The First Avenger, The Wolfman 2010), Jurassic Park III is silly, stupid fun. It's not out to bring anything to the screen other than straightforward dinosaur action, and it gets to that action really quick. That search and rescue mission falls apart in record time. It's frequently laughable, but that's just part of its charm. Also part of its charm is the fact that its action goes places the action in the others didn't. It's almost like the filmmakers asked themselves, "What did we not get around to doing the other times?" and then built a film around those action set pieces. 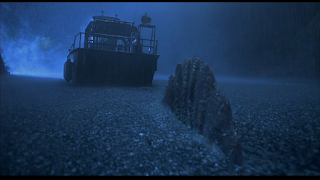 For example, there are aquatic thrills because the Spinosaurus is just as deadly in the water as on land, and flying dinosaurs are added into the mix with a Pteranodon attack. Billy gives chase with the parasail wing when one of the Pteranodons snatches up Eric. 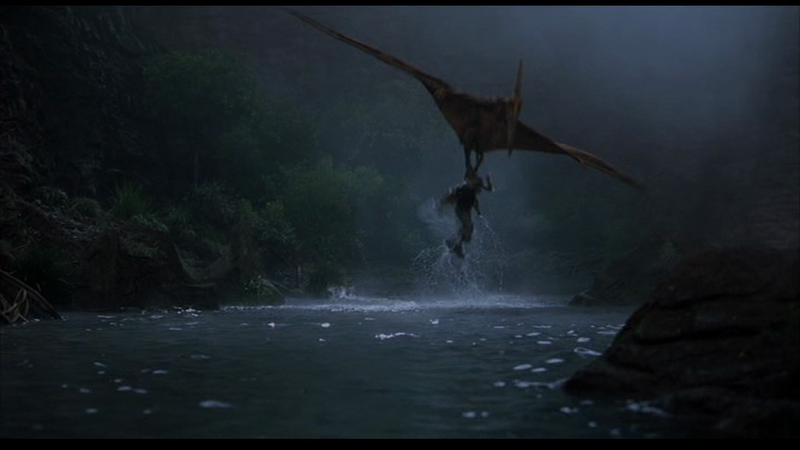 That's a good example of how ridiculous Jurassic Park III is - a character uses a detached parasail wing to save someone from winged dinosaurs. If that's not the sort of thing you feel like you need to see immediately, I can't help you. But if it is, I can advise you to watch Jurassic Park III as soon as possible. 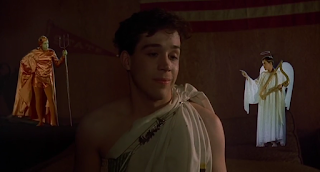 Having endured for nearly forty years now, director John Landis's Animal House is known for being one of the funniest comedies ever made - a reputation that I don't see going anyway any time soon, even if modern viewers probably won't find it as amusing as moviegoers in 1978 did. I have never found it to be hilarious myself, although it does have some very funny moments and its characters are fun to spend time with. Written by Harold Ramis, Douglas Kenney, and Chris Miller, the film is set at Faber College in 1962. Our guides into this place and time are freshmen Larry Kroger (Thomas Hulce) and Kent Dorfman (Stephen Furst), who are looking to join a fraternity. Not fitting in with the uppity members of Omega Theta Pi, who take frat life very seriously, Kroger and Dorfman have to resort to pledging to Delta Tau Chi, which is known as the worst house on campus... Given the fact that they have piss on their legs before they even reach the front door, Delta quickly lives up to its reputation. Delta may be frowned upon, but its members - which include Tim Matheson as Eric Stratton, Peter Riegert as Donald Schoenstein, Bruce McGill as Daniel Simpson Day, and John Belushi as John Blutarsky (a.k.a. Otter, Boon, D-Day, and Bluto, respectively) - are a likeable bunch. These guys aren't taking college seriously at all, irreverently placing their focus on girls, drinking, and music. Their house is a disaster zone, their grades are poor, but they're enjoying themselves. Unfortunately, Dean Vernon Wormer (John Vernon) has made it his mission to revoke Delta's charter. He places Delta on "double secret probation" and enlists the Omegas to help him find enough reasons get the "animal house" shut down. The Deltas provide him with plenty of reasons while cheating on tests, playing pranks on the Omegas and the dean, and in Otter's case sleeping with wives and girlfriends. That's all there is to it - watch the Deltas behave badly while Wormer and the Omegas are gunning for them. Along the way, some of the characters might even find a way to grow up a little. It's a bit of an episodic film, meandering from scene to scene while throwing out an onslaught of humorous lines, goofy line readings, and sight gags. It's so meandering that Landis's first cut was nearly 3 hours long, but he managed to cut it down to a more reasonable 109 minutes. I may not get enough laughs out of Animal House to rank it as highly as many others do, but I am very entertained by the film and have a lot of respect for it. 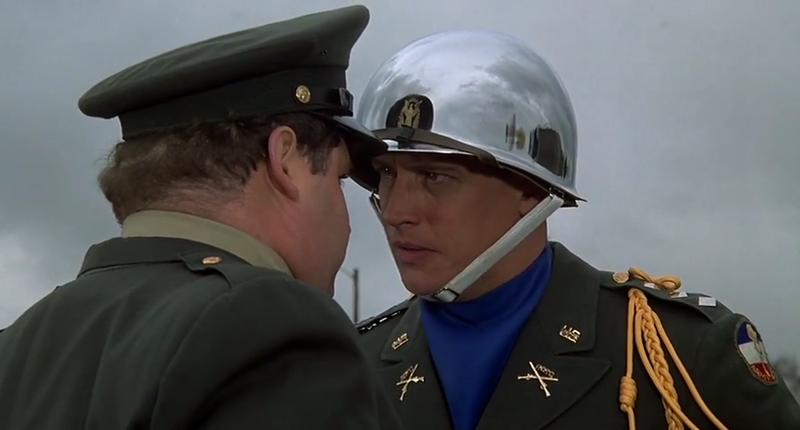 There are moments and lines that I will never forget, my particular favorite moment being the outrage displayed by Omega Douglas Neidermeyer (Mark Metcalf) over "a pledge pin?!" I respect the film so much that my mom and I took a three hour round trip drive to a theatrical screening in the early 2000s just to get the chance to see it on the big screen. It's considered one of the greatest comedies of all time, I couldn't let that opportunity pass by. Parents, if you're out in a public place with your young child and get a call on your cell phone, don't turn your back on your kid while you're having your phone conversation. In the last month I have seen two movies in which a kid was abducted because their mother looked away from them, despite the fact that they were surrounded by strangers, simply because she got a phone call. One of those movies was director Luis Prieto's Kidnap, which I had been looking forward to seeing because the trailer reminded me so much of the 2013 thriller The Call. In that film, Halle Berry played a 911 operator who became a teenage girl's only hope for survival when she's abducted by a serial killer. Berry's character Jordan stays on the phone with the girl throughout the film, most of which occurs during the drive to the killer's lair as the girl desperately tries to find a way to escape. Berry plays a different character, Karla Dyson, with a different occupation (she's a waitress) in Kidnap, but if The Call had spawned a sequel one could easily imagine that Knate Lee's Kidnap screenplay could have served as the basis of the follow-up with some minor tweaks. If Karla were Jordan, it'd be déjà vu all over again when she witnesses a youngster being kidnapped and shoved into a car, but this time the stakes are personal - the child being abducted is Karla's six-year-old son. Seeing the vehicle that her son has been taken in, Karla jumps into her minivan and gives chase... And the majority of this film is taken up by the ensuing car chase, during which Karla desperately tries to alert other drivers to her situation, to get police on the case, even if she has to break laws and get law enforcement on her own tail. She can't just call 911 and talk to someone like Jordan because she dropped her cell phone before speeding after the abductors. It seems that I was one of few people who were anticipating Kidnap, as the film didn't do so well at the box office. The film didn't disappoint me, though. It was just the sort of engaging and entertaining chase thriller I was hoping it would be. Sure, it got ridiculous at times, but I was always invested in Karla's ordeal and rooting for her to save her son by any means necessary. Prieto did a great job directing the chase, and Lee threw all sorts of obstacles in Karla's path, so much that I could only smirk and shake my head as her progress kept getting thwarted left and right, while also making sure that she can pull off the impossible and stay just one step behind the villains for the duration. If you like this sort of thriller and can suspend disbelief, Kidnap is a must-see. I can't wait to show it to Priscilla. Things begin with heroes and villains firing guns and rocket launchers at each other as a group of terrorists hijack a military convoy. Once the terrorists have killed a bunch of people, blown some stuff up, and successfully stolen whatever it was that the soldiers were hauling, the film cuts away to another group of soldiers dealing with a hostage situation... As it turns out, the terrorists this second group of soldiers are dealing with aren't really terrorists, this is just a training exercise that several minutes of the film are devoted to. With all that sort of stuff out of the way, the movie can get to the point. Dinosaurs. When the stolen shipment is taken to a warehouse in Los Angeles, the terrorists find out it's not the uranium they were hoping for, but rather a pair of Velociraptors and a T. Rex. Prehistoric creatures that proceed to tear them to pieces. The special forces team we saw training earlier are deployed to track down and secure the stolen dinosaurs, giving us the set-up for a film that is a lesser version of Carnosaur II: we have a team of armed heroes taking on dinosaurs in a confined location (in this case, the dinos end up hitching a ride on a cargo ship), but the way it's presented isn't as fun or as interesting as the scenario in the second film. The movie drags its feet too much, there's too much chit-chat, and I don't like the characters as much - despite the fact that the team is led by Family Ties' Stallone-alike Scott Valentine and one of the members is played by Rick Dean, who was one of the team members in the previous movie. He got a haircut between films and plays a different character in 3 than he played in 2. Another familiar face among the dino-fighters in this film is Morgan Englund, who I knew from the daytime soap opera Guiding Light, which counted both my mom and grandma among its devoted viewers. Carnosaur 3 is Carnosaur II made dull and doesn't provide much entertainment, but I still watch it from time to time because that's the curse of being a completist. Worth Mentioning - Full Moon. New Blood.